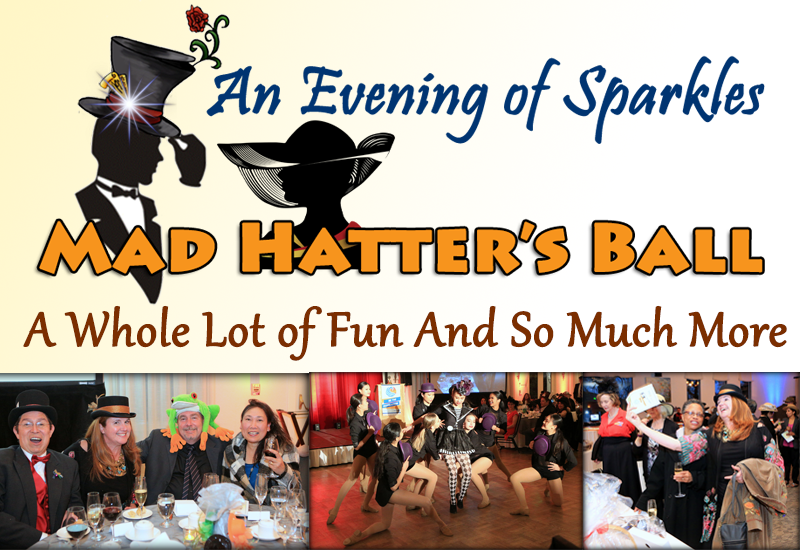 On February 23, more than 135 guests came together to enjoy an elegant dinner, entertainment and sport fanciful hats of all kinds at our major fundraiser. Our successful live and silent auctions will fund our Rotary programs to benefit local youth, seniors and grants to local organizations for about two years. In addition, we raised over $12,000 to provide a grant to our featured beneficiary, the Centerville Free Dining Room. This will help replace much needed and outdated kitchen equipment to feed the hungry and homeless in our community . View a photo album to get a taste of all the fun we had. Tis the season for giving and sharing. 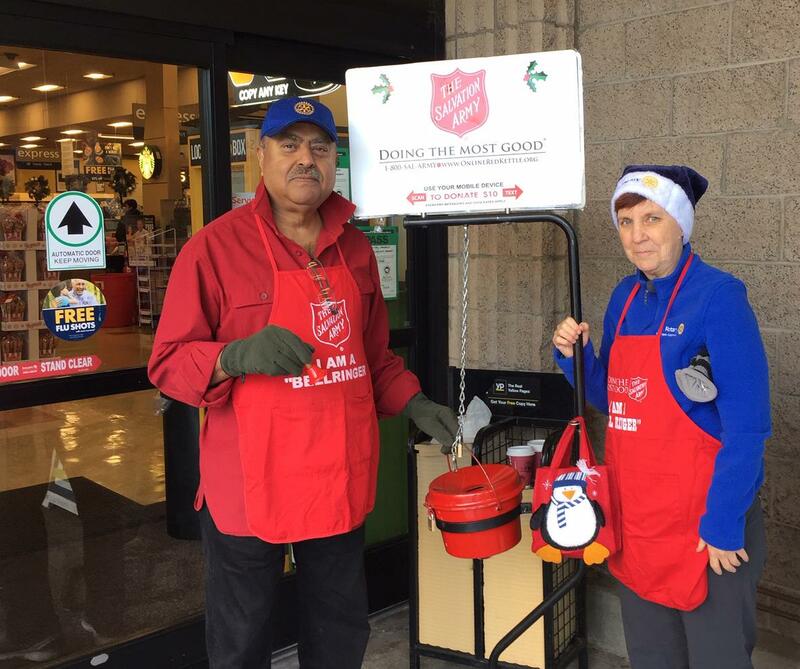 On December 1, Rotary Clubs in the Tri-City area gave of their time volunteering to ring bells and staff the familiar red buckets of the Salvation Army. Members of our Club partnered with the Rotary Club of Mission San Jose to collect donations at the Safeway Store in Irvington from 10 am to 6 pm. Karen and Jeboy Koshy (shown here) even endured the cold and rain to begin their shift. But they still cheerfully greeted customers who gladly dropped a few dollars in the pot so that those in need will have a happy holiday season. 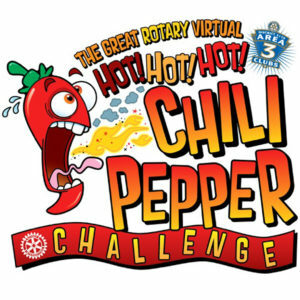 We would like to thank everyone who participated in the Hot Chili Pepper Challenge which ended October 31. Initial results show that our Club raised about $1,375 toward our designated charity, the Rotary Tri-City Free Clinic. These funds will be supplemented with donations from the event sponsors. 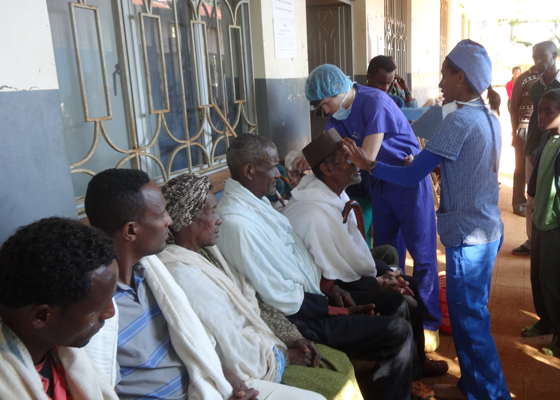 The Rotary Tri-City Free Clinic provides basic medical services for those in homeless and domestic abuse shelters that are not funded from other sources. 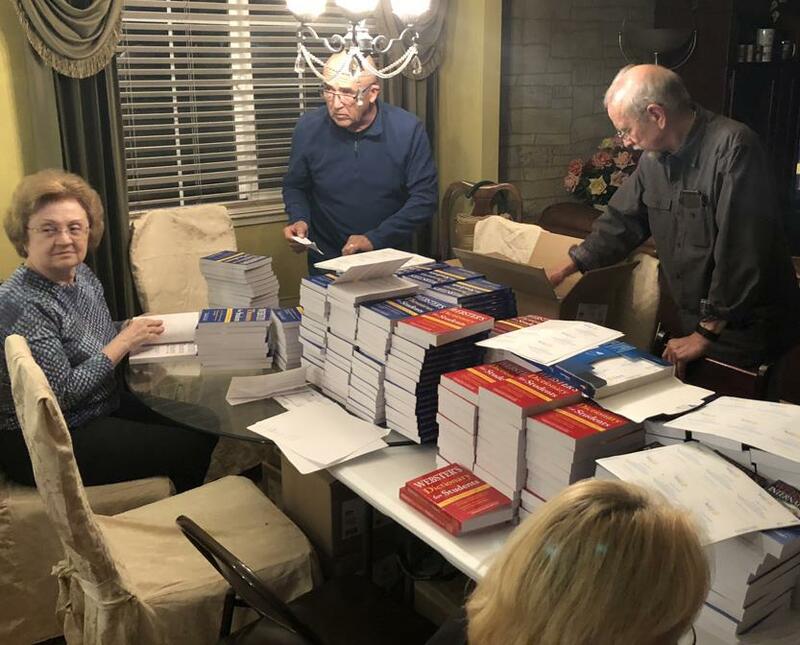 Some of our Club members recently gathered around a table to prepare and sort over 800 school reference books for distribution to fifth graders in 11 elementary schools in Fremont. 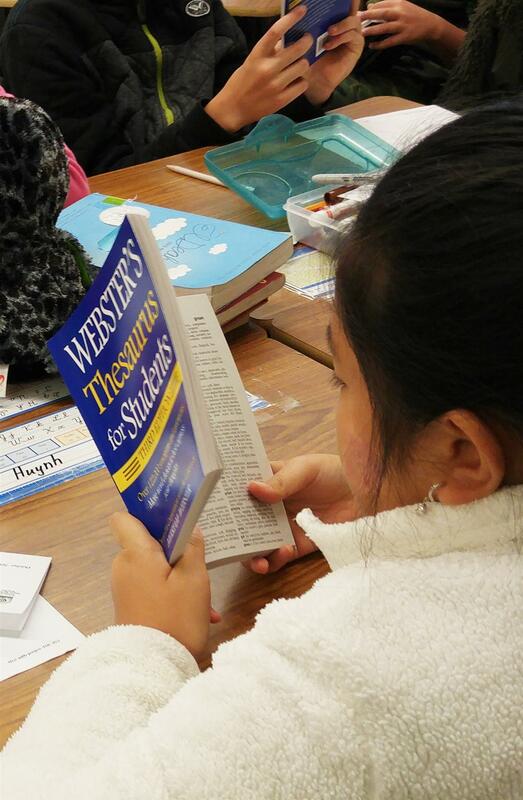 Each fifth grader receives their very own thesaurus, dictionary or world atlas for use in their studies. We attach a bookplate to each volume where students can write their name and use the books at school or at home. Expanding a child’s vocabulary or knowledge of geography helps to develop interesting and knowledgeable ways to express themselves and succeed in their education. Over the next several weeks, our members will visit each classroom to personally deliver and show students how to use these essential tools. Greg Bogdanoff was honored at the 2018 Community Hero's awards presented by State Assembly Member Kansen Chu on July 12, 2018. These awards recognize persons in the south bay area who make significant contributions to their community over the year. Greg was singled out for his many years of w0rk dedicated to the Warm Springs Little League which has allowed youth baseball to thrive in southern Fremont. 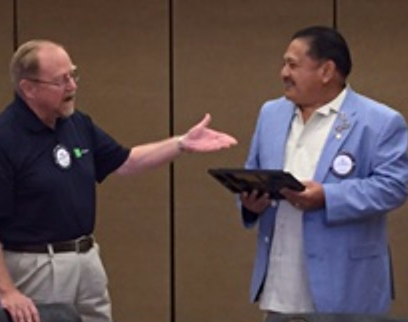 Greg was also cited for his contributions to the community with over 11 years of service as a Rotarian. 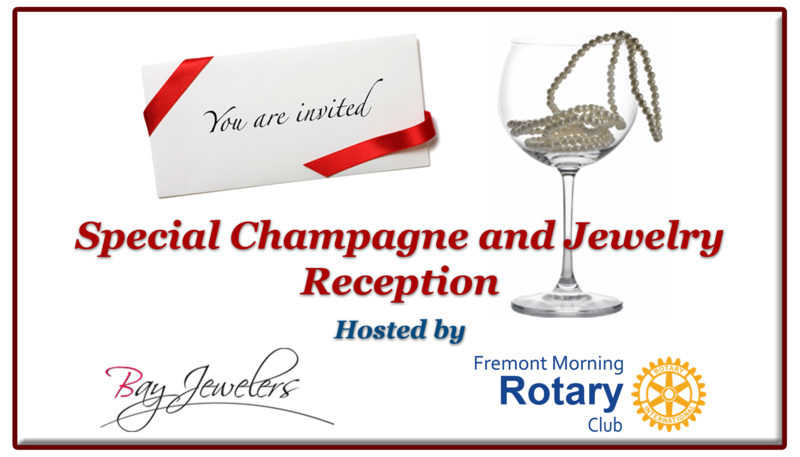 Greg is a past president of the Fremont Sunrise Rotary Club which is the predecessor club of Fremont Morning Rotary. Our Club is proud to provide ongoing support to Life ElderCare who offers free, simple and important services for older adults who prefer to remain living at home. 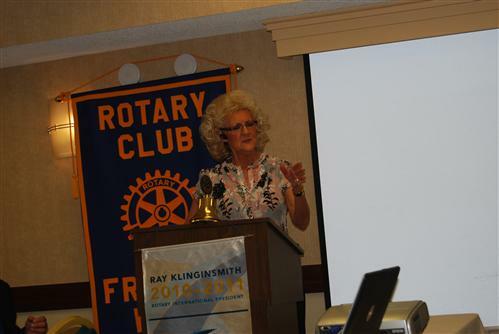 We were pleased to have Jennifer Shively as a guest speaker at our Club meeting on May 18. 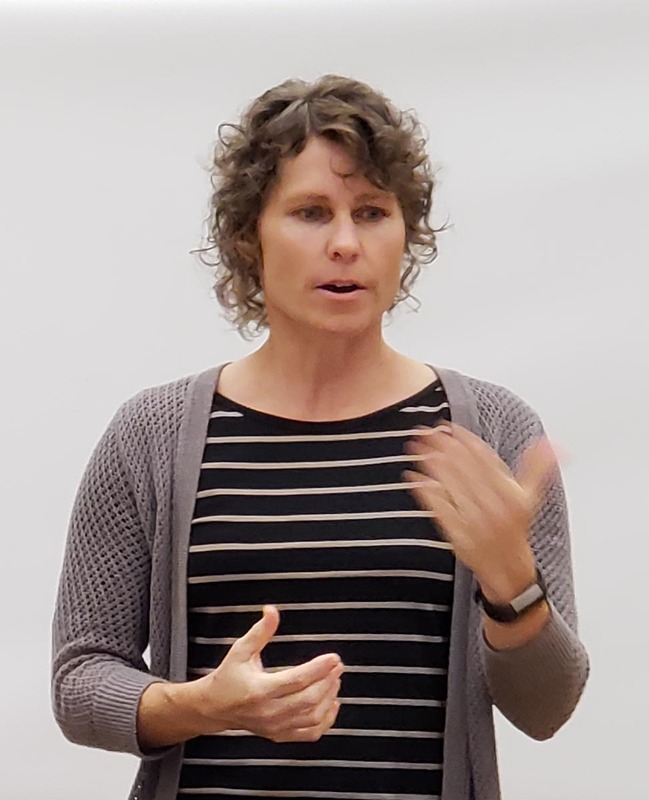 Jennifer coordinates Life Eldercare’s Fall Prevention Program for seniors and explained how this program works with seniors in their homes to help keep them safe and healthy. She is also a master trainer for the Matter of Balance program which is a wonderful exercise and education program that helps manage the fear of falls. In addition to Fall Prevention programs, Life ElderCare also provides Meals-On-Wheels (for which one of our members volunteers), VIP Rides and senior home visits that makes independent living possible and pleasant for seniors. 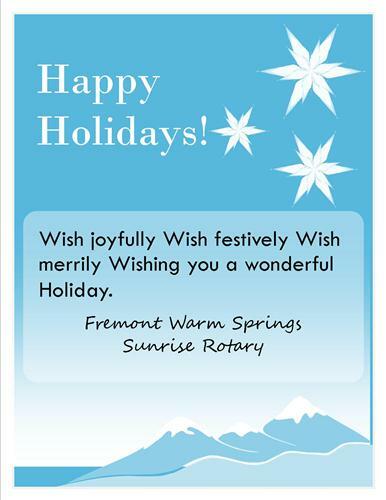 All of us at the Fremont Morning Rotary Cub want to wish everyone joy and peace during this holiday season. 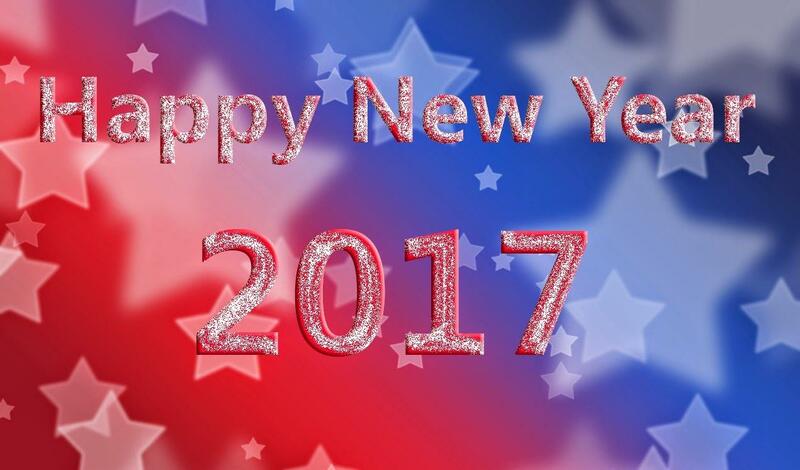 This is a time to reflect on and be grateful for the good we have experienced this past year and look forward to the good that can be accomplished in the year ahead. 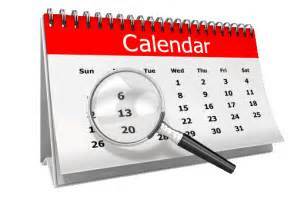 Because of the holidays, we will have NO MEETING on Wednesday December 27. Members of our Rotary Club painted the interior of the counseling rooms at SAVE headquarters between Monday, Sept 11 and Thursday, Sept 14. 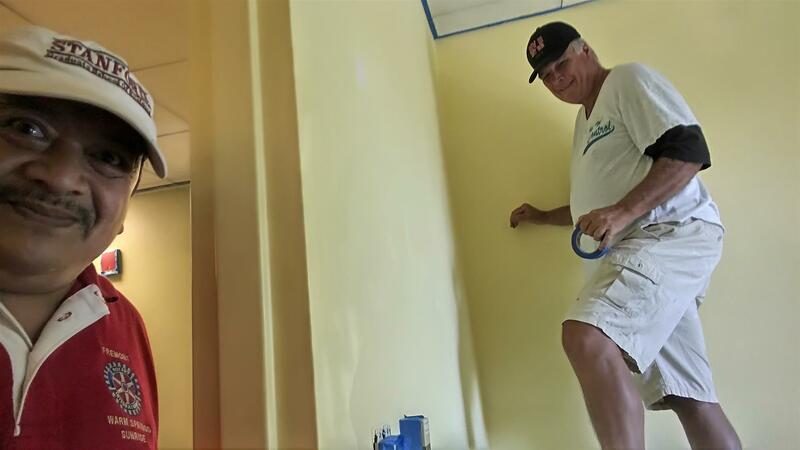 The interior rooms of the counseling center at SAVE were originally painted in egg-yolk yellow and needed a fresh coat of paint. So we volunteered to pitch in and do the painting project. Many of the volunteers, including members of our Rotary Club, gathered to celebrate the 29th anniversary of the Centerville Free Dining Room. Since 1988, they have been serving hot nutritious dinners to the homeless and hungry of our community every Tuesday and Thursday from 4 -6 pm. Our Club partners with the Rotary Club of Mission San Jose to purchase, prepare and serve dinner every month with a “Fifth” Tuesday. 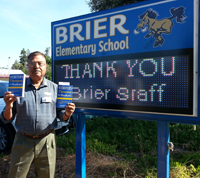 Our Club’s annual project is to distribute useful reference books to about 1,000 local 5th graders in 11 grammar schools in the Irvington and Kennedy High School service area of Fremont. Each of these students received either a Dictionary, Thesaurus, or World Atlas of their very own to keep to be used at school or at home. In some cases, these may be the very first book they have to call their own. While books may seem “old school” in this day and age, they are a valuable and convenient tool that students can use to develop increased literacy. This is most helpful to build the needed skills to express oneself, encourage a curiosity for learning, and succeed later in life. 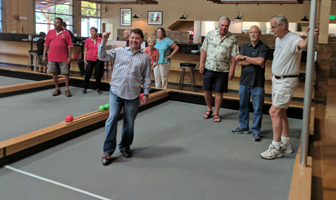 While fun is always a big part of our philanthropic endeavors, we also take time out regularly to enjoy each other’s friendship just of fun’s sake. This month we gathered for a Special Spring Social and Club Reunion. 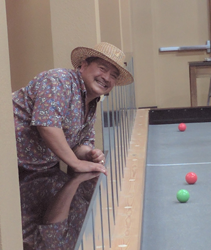 We invited past Club members to join us for relaxing games of bocce ball, fabulous food and a good laugh or two. Social events like these really bring us together with a sense of comradery and in this case, some good hearted competition. The Grateful Garment Project is an organization that makes a tangible contribution to our community. They provide new clothing to victims of sexual assault so that they can leave medical facilities after forensic exams with a level of dignity. Last fall, our Club made a substantial contribution to their organization to purchase needed clothing items. But we did not want it to end there. Earlier this month, several of our members spent a Saturday afternoon helping inventory donated clothing and brought some new blankets to add to their list. Even small gestures make a big difference to someone. November 1: We will have our monthly social meeting at Little Madfish Restaurant in lieu of our regular Wednesday meeting. See our event details in the right column. November 10: We will have a special Veterans Day event in lieu of our regular meeting on November 9. November 16: Due to renovations at our regular meeting place, will meet at the Original Pancake House, 39222 Fremont Blvd. Follow this link for map and directions. November 23 and 30: We will meet at our usual location, the City of Fremont Senior Center. 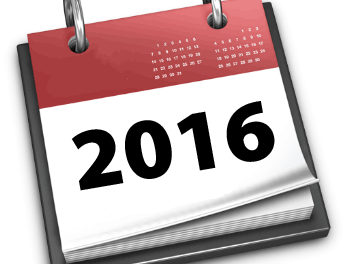 Check back to our website for meeting locations as they are determined. As always, guests and visitors are welcome to each of these meetings. On November 10, we will join the other Rotary Clubs in our area to commemorate Veteran's Day and honor all who have served in the armed forces for our Country. We will meet at Washington Hospital, West Building, Conrad E. Anderson Auditorium, Conference Room A located at 2500 Mowry Ave, Fremont, CA. This event is truly a moving and special occasion which allows us to demonstrate our appreciation for this great country we live in. Our regular breakfast meeting on November 9 will be canceled. 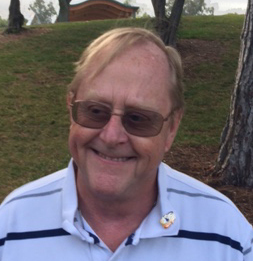 Rotary District 5170 Governor Jeff Orth will visit our Club at our regular meeting on August 17. 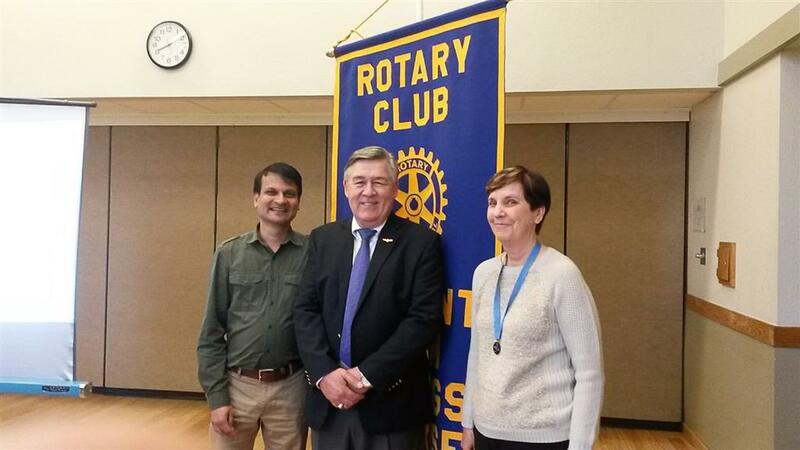 The purpose of this meeting is to see how things are going with our Club, to talk about projects, events and the accomplishments that our club is proud of, and to recognize our member's pledges to support The Rotary Foundation. He will discuss central priorities of the District for this year so that we can plan our activities to be consistent with them. Finally, he will inform us about how District and RI resources may be of assistance in accomplishing these goals and overcoming obstacles. These visits help our club to participate as a team with the many other clubs in our district to achieve a productive year. Well, it is that time of year when our Club elects new officers. 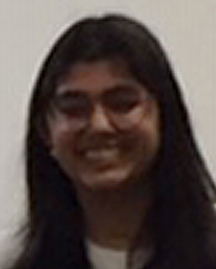 Geeta George has reached the end of a successful year as Club President. Under her leadership we continued to our service programs for youth in our area and provided grants and hands-on service to a number of local organizations that make our community what it is. 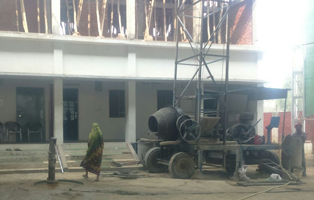 We also engaged in a new project as well. 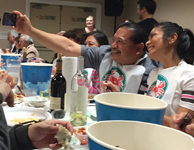 Partnering with the Rotary Club of Mission San Jose, we committed to serve dinner to the hungry at the Centerville Free Dining Room on an ongoing basis every fifth Wednesday of the month. 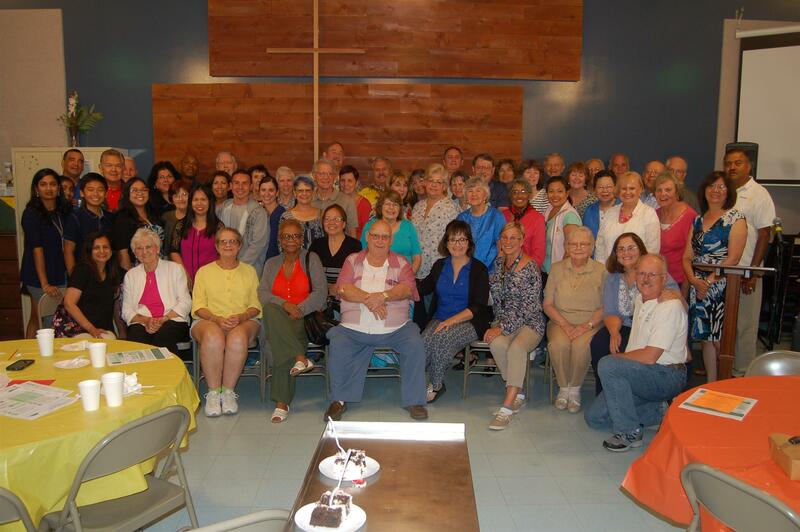 To celebrate Geeta's year and install Don Bierman as our new Club President, we gathered for a dinner and roast. We are serious about having fun, so Fenton Kremer kindly memorialized this event with a photo album that can be viewed here. As part of Meals on Wheels Month, The Alameda County Board of Supervisors and Congressman Mike Honda presented a proclamation to LIFE Eldercare for their work to deliver nutritious meals and safety checks to our homebound seniors. 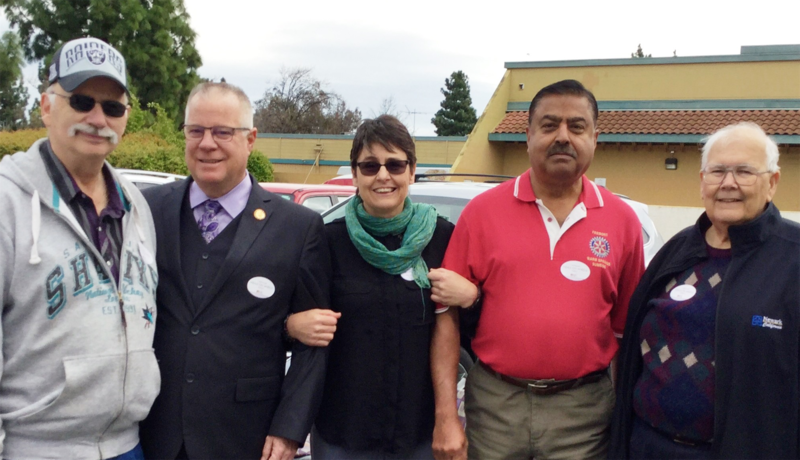 Our Club has been a longtime supporter of LIFE Eldercare and our member Jeboy Koshy (pictured in the red Rotary Club shirt) has been a Meals on Wheels volunteer for over 10 years. 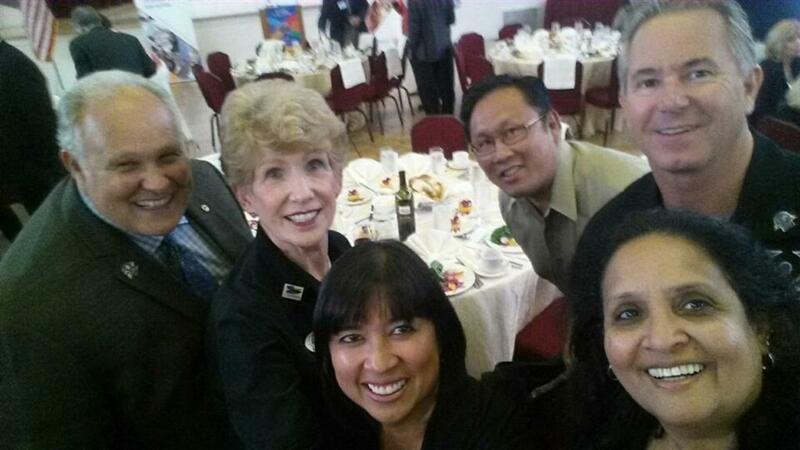 He is accompanied by Alameda County Supervisor Scott Haggerty, Newark Mayor Al Nagy, LIFE Eldercare Executive Director Patricia Osage, and Life Eldercare Volunteer of the Year Larry Roberts. 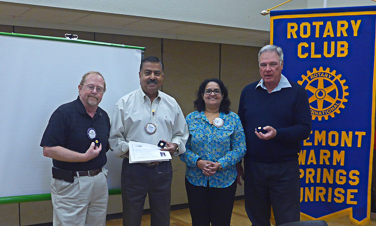 Club President Geeta George presented the Paul Harris Fellow award to members Don Bierman, Jeboy Koshy and Greg Bogdanoff for their contributions to The Rotary Foundation. Members earn this award for each cumulative donation of $1,000 to Rotary’s non-profit foundation which is used to fund all of Rotary’s worldwide projects to foster world peace, provide clean water, eliminate hunger and combat illiteracy to name a few. It is noteworthy that each of these members have received multiple Paul Harris Fellow awards over the years. 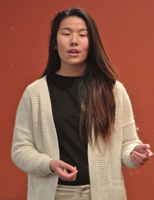 Each year, the Richard D. King Rotary District Speech Contest stretches from February to late April to reward the best high school speaker from our district’s 53 clubs. 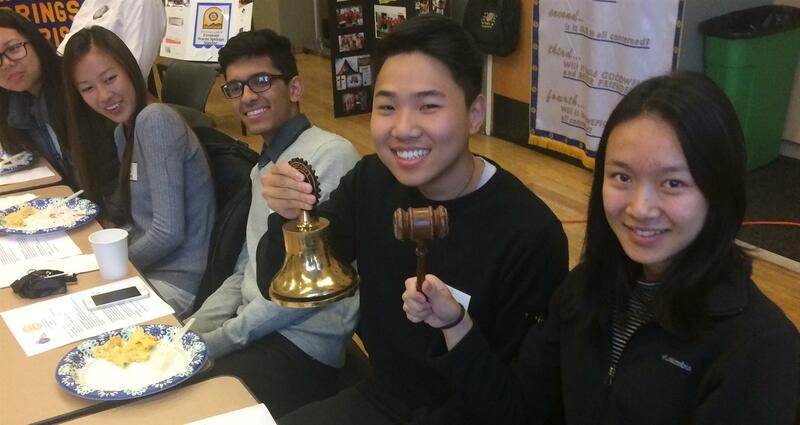 This year’s theme is “Be a Gift to the World.” Irvington High School Student Kitty Hu, pictured right, won our Club’s contest with an inspiring account of how she learned the value of service above self so that she, in turn, can aspire to become a gift to the world in her own way. 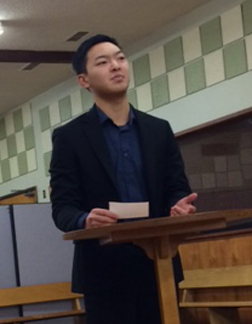 About 14 students from Kennedy and Irvington high school Interact Clubs attended our January 27th meeting. It is always a pleasure to have them visit to build our ties and share their enthusiasm for service. We thought that we would use this opportunity to have a little fun. Instead of just being visitors, we turned the table on them by having them conduct our meeting, as if we were the visitors. And, they came prepared! Good friends and good food; the perfect combination for a good time. 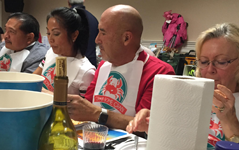 We shared great times with area Rotarians at the annual Newark Rotary Crab Feed on January 23. 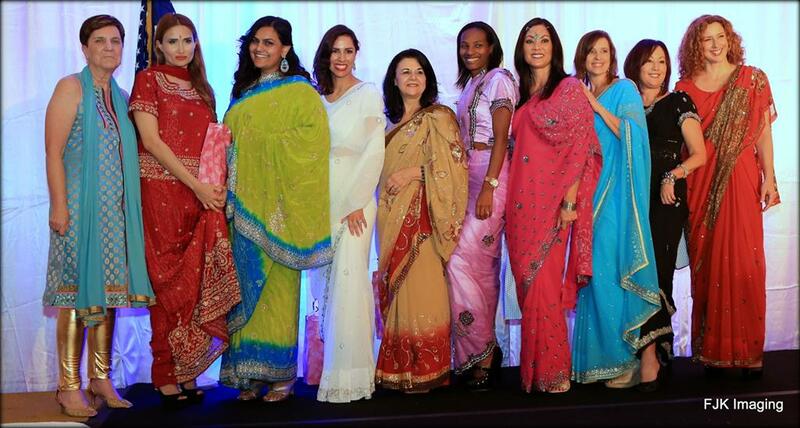 You can view more photos of this event and others on our Facebook page. 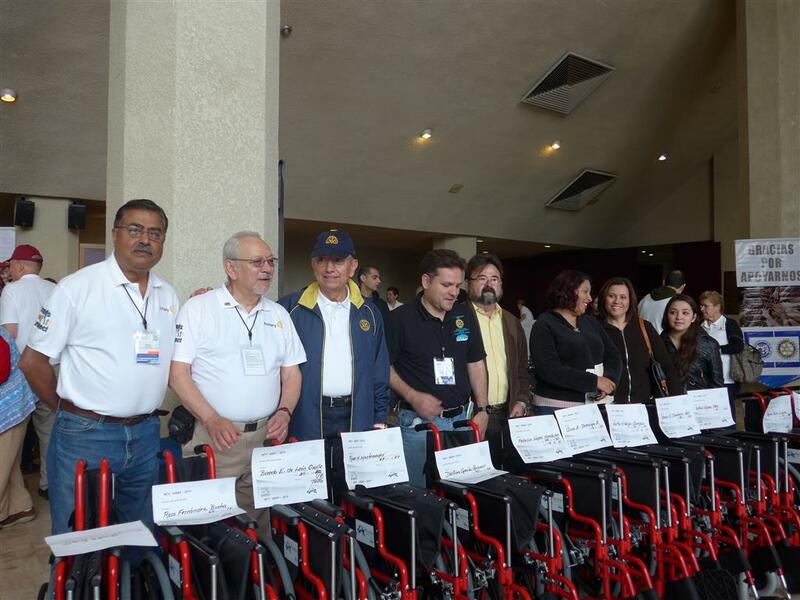 One of Rotary International’s major initiatives is to promote literacy worldwide. Promoting literacy is not limited to third world countries or impoverished areas. Rather, it is a universal need that helps anyone improve their chances for a better life. Our Club is doing our part to bring a useful literacy tool to our local area. 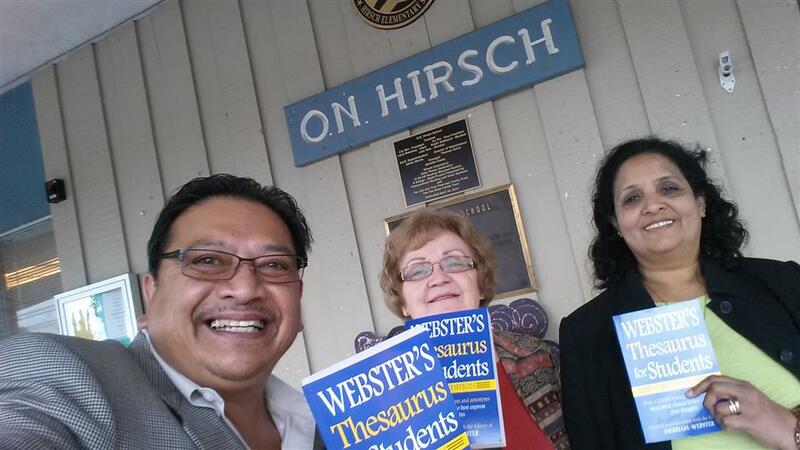 This month, we presented a thesaurus to every fifth grade student in the Irvington and Kennedy High School service areas. We visited 10 elementary schools and gifted over 1,100 students their very own thesaurus to keep as their own to expand their vocabulary and learn more expressive ways to communicate. While students can find similar resources online, they were truly excited to get their very own book to keep at school or take home and each student took time to write their names in the cover plate of the book. 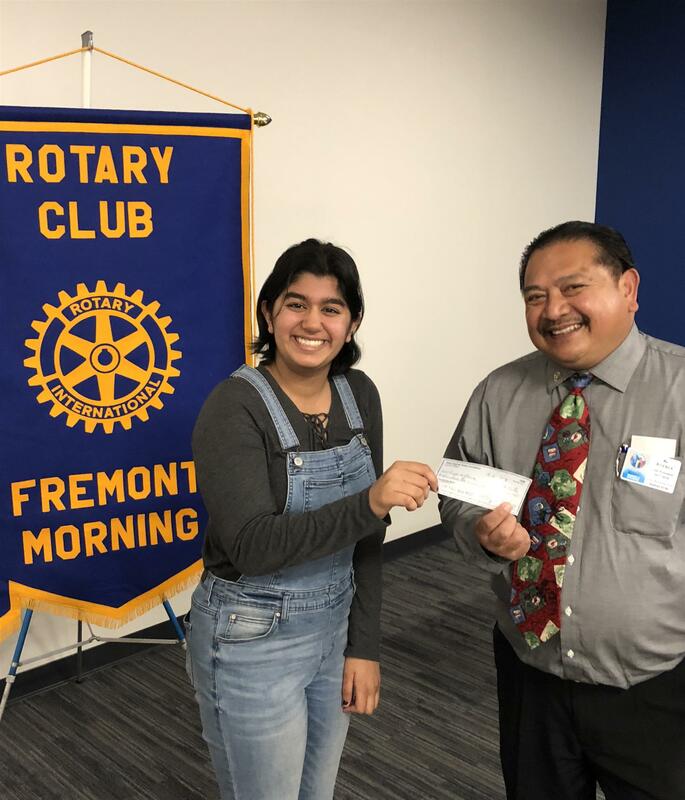 Our Club promotes community service by students by sponsoring Rotary Interact Clubs at local high schools and supporting their serivce projects. This month, we are contributing $250 to the Irvington High School Interact Club’s “Survival Sacks” project. This project is part of their goal to dispel the notion that the homeless are untrustworthy, uneducated, scary, or dangerous. They are assembling and distributing survival sacks containing a tooth brush, toothpaste, small towel, a blanket, soap, disposable hand wipes, and other basic needs. 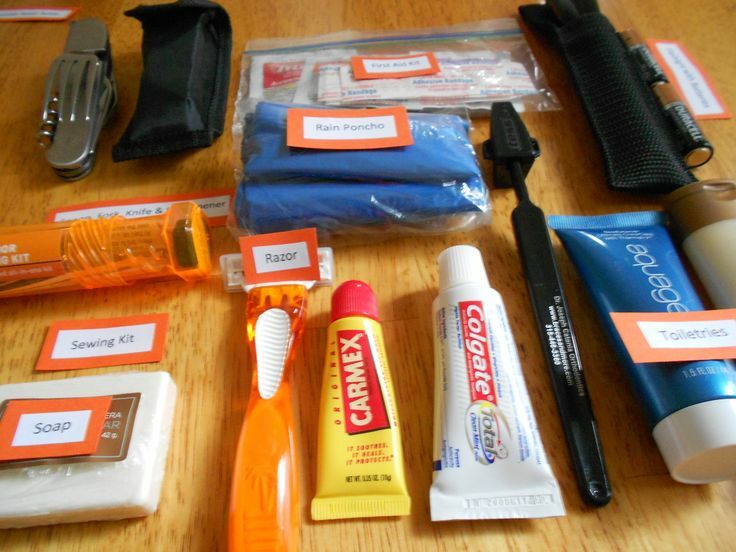 These items will be particularly useful as we approach the winter weather. The kits will also include a cheer-up note from the Interactors to let the homeless know that people do care and are willing to lend a helpful hand. 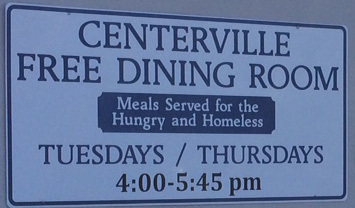 One of the community organizations our Club is proud to support this year is the Centerville Free Dining Room. It is operated by the Centerville Presbyterian Church to feed the hungry and homeless a hot dinner each Tuesday and Thursday. They also offer selective take-home packaged food items and other needed items such as toiletries. Not only are we making a financial contribution to this needed service, we are also making it personal by having the honor to join their volunteers several times this year to help serve the meals. Who says you can't have fun and accomplish a lot of good at the same time? 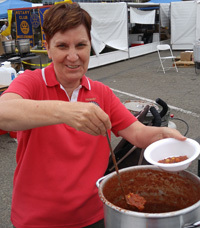 On Saturday, September 12 the southern Alameda County Rotary Clubs hosted the 24th annual Beer & Chili Fest at Newpark Mall in Newark. 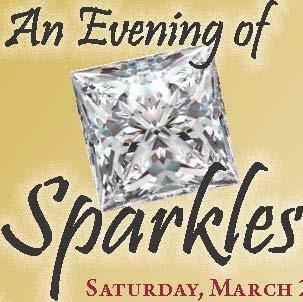 This was our major annual event to benefit local Rotary Club philanthropic projects and other charitable organizations. 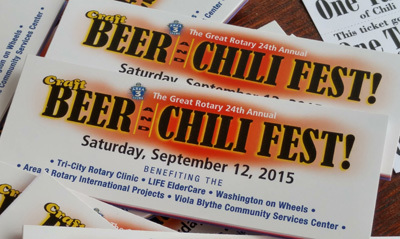 About a dozen organizations prepared samplings of their best chili and 9 local breweries were on hand to provide tastes of their beer to wash it all down. Add live music, arts & craft and vendor booths and a Kid Zone to keep the little ones entertained, and you end up with an afternoon of fun that will help a whole lot of people in need. Dave and Connie Clayton purchased and delivered 2 complete sets of Welcome Home Baskets for Military Returning Veterans settling in the Bay Area. 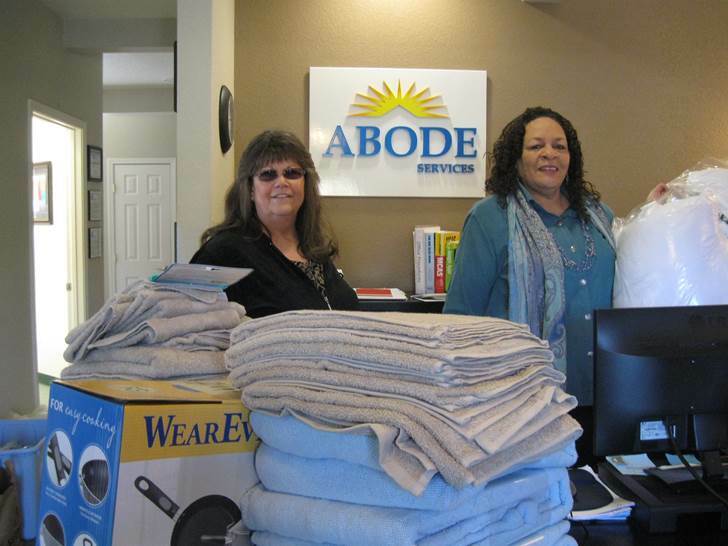 A lengthy list of new home supplies including blankets, towels, dishware, kitchenware, and other necessities were purchased by Dave and Connie which they delivered to Jean Morgan at Abode Services on Dec 5th this year. Abode Services manages the Welcome Home Basket program and makes sure that returning members of the military have needed household supplies to start their new home in the Bay Area. We have another fabulous item for our Live Auction on May 19th. 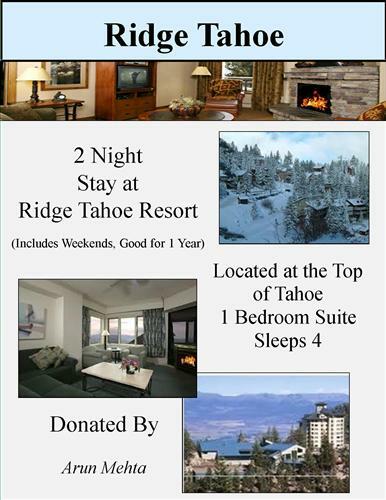 A weekend stay at Ridge Tahoe. Overlooking the breathtaking and beautiful Carson Valley, and nestled on a spectacular Sierra Nevada ridge above Lake Tahoe, this 11 acre hotel resort offers year-round vacation rentals with panoramic views and luxurious accommodations. Complimentary Health Club, Indoor Sports Complex, Indoor/Outdoor Swimming Pools and Jacuzzis, Restaurant, Deli, Market, Full Service Spa and more are all on-site. Shuttle service whisks guests 6 miles to Lake Tahoe and casino nightlife. The magnificent hotel resort is located on Heavenly Ski Resort’s Nevada slope, adjacent to the Stagecoach Lodge and ski chair lift. Our 302-unit resort features Deluxe Hotel Rooms, Junior Suites, One and Two Bedroom Condominium Suites. This year, our Club President Eva Stone wants to recognize the sacrafices that our military personnel and military families make for our country. As part of our giving back, the Fremont Warm Springs Sunrise Rotary Club put together 40 care packages for soldiers overseas. Books, toiletries, candies, food and much more were boxed up and the packages were delivered to Blue Star Moms for labeling and mailing. Our club would like to thank each and every soldier and their family for their contribution to world peace. They were able to smooth dirt and lay material down to detain weed growth for landscaping. Luis worked on a water line that was leaking. We had to shut the water off for about an hour so we could fix the corroded pipe. Alex, our Rotaract Ambassador, took the lead in organizing everything at the Wednesday Rotaract meeting. Luis and Don facilitated getting tools along with food and water. Alex really showed his leadership in getting everything facilitated to completion. We need to commend our Rotaract Team for everything they do in support of our Club! We have many youth programs in Rotary: Interact, RYLA, ELC, Youth Exchange, Mentoring, Children at Risk, … It is important that we protect our youth from abuse and harassment. Our District and Rotary International have policies that guide clubs, Rotarians and all adult volunteers involved with youth in any of our programs. The Youth Protection Certification process is designed to ensure that all adult volunteers are aware of potential problems and how to handle them. Our club members need to complete the on-line training and the Life Scan background check. Our Youth Protection Officer (YPO) is Mike Kearns. 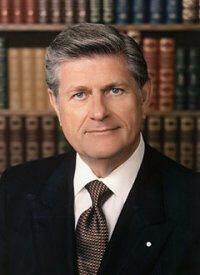 He will be letting each of you know what you still need to complete to be compliant with the Rotary requirements. 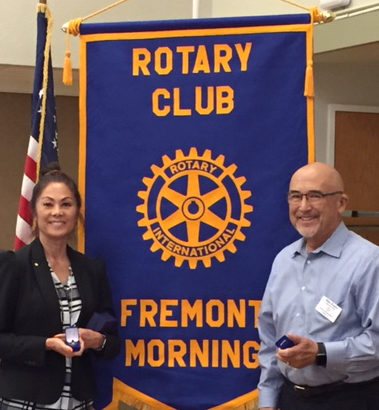 Fremont Warm Sprngs Sunrise Rotary has a close working relationship with the Warm Springs Elementary School. 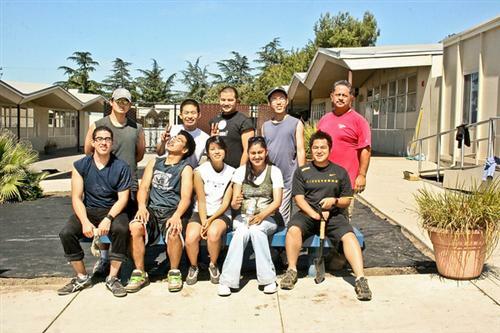 We have helped on school projects in the past and are back once again this summer working on a courtyard project. There has been a continual problem during the wet season where this courtyard and walkway is located. 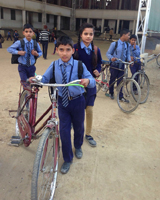 It is situated next to a small dirt hill and when it rains, the mud washes down onto the courtyard and walkway making a muddy mess for the students. 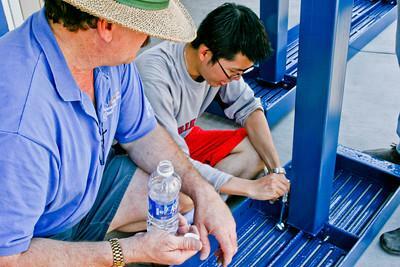 Fremont Warm Springs Sunrise Rotary has teamed up with Interact Students, Rotaract members to fix this problem. A drainage ditch and small curb is being installed to direct the water and mud away from this area. Benches are being installed so students will have more seating between class period. Work on this project was started the weekend of July 30 and hope to be finished before the school's 75th Anniversary Celebration in October. A plaque will be dedicated to our Rotary for all our work at this celebration. Teen Challenge is a 12-18 months recovery program that has been in the Bay since the 1960's. Today there are over 200 homes in the United States alone that provides help to those struggling with any type of destructive and abusive addiction and lifestyles. Teen Challenge was started 53 years ago to help teenagers and has grown to assisting men, women, teenagers, children and entire families who are on the road to recovery. Teen Challenge NorWestCal/Nevada has been in the Bay Area for over 30 years. They have five homes in the Bay Area, two in Nevada and three in Humboldt County. Worldwide, they have over 1,400 facilities outside of the United States. In the South Bay, Teen Challenge has two centers for women and the Asbury Center, which is a family center. The Asbury Center is the only center of its kind in the world within the Teen Challenge organization which takes in families. Teen Challenge receives their clients by word of mouth and thru the court system. Seventy percent (70%) of their funding comes from donors with the remaining thirty percent (30%) made up from their work study program and fundraising. The cost to the organization is approximtely $2,400/month per client. Attending the program today was Randy, a young women who is completing the program at Teen Challenge. She came from a life of abuse and addiction and has learned what a safe home and a family should look like. She has learned self esteem and how to care for herself and her child. 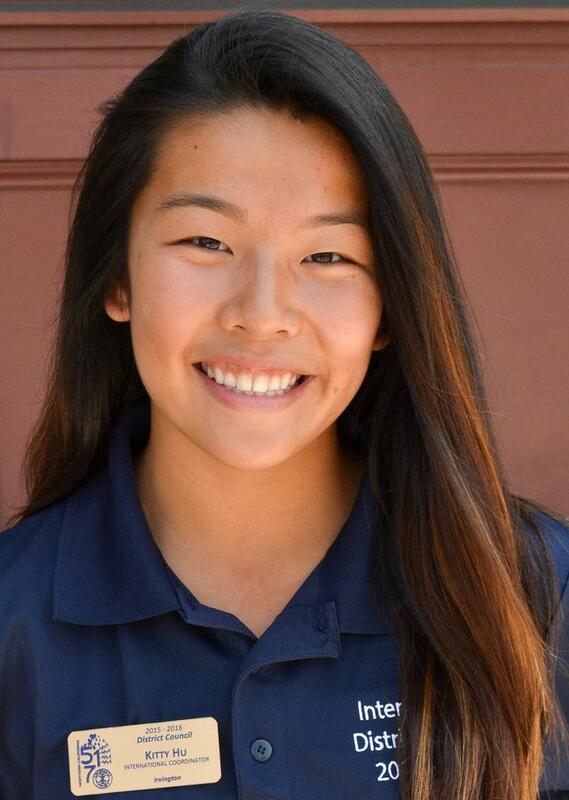 She is leaving the program an entirely different person than the one who entered a year ago. For more information on Teen Challenge you can go to www.teenchallenge.net. Judy Woodard was our speaker today. She is the Director at the women's and children's home here in San Jose. 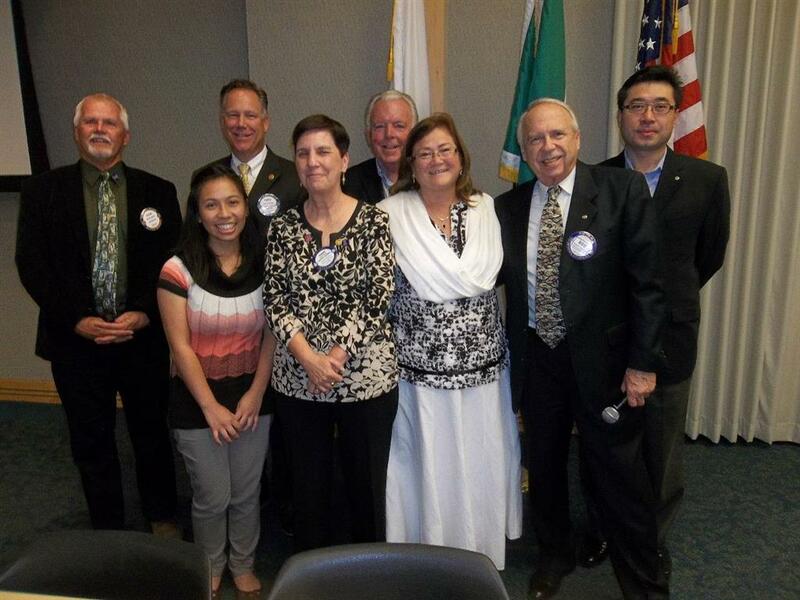 Create Outstanding Growth in your Rotary Club! The following report is from the Rotary Club of Springfield Oregon (D511) who had a spectacular year of bringing in new memers in 2009-2010 and seems well on their way to having another great year. Read on . . .
Rotary Foundation Matching Grants bring music, dance, and opportunity to underprivileged children at the Bitone center in Uganda. See the story in an excerpt from the Rotary Video Magazine, volume 5, issue 2. 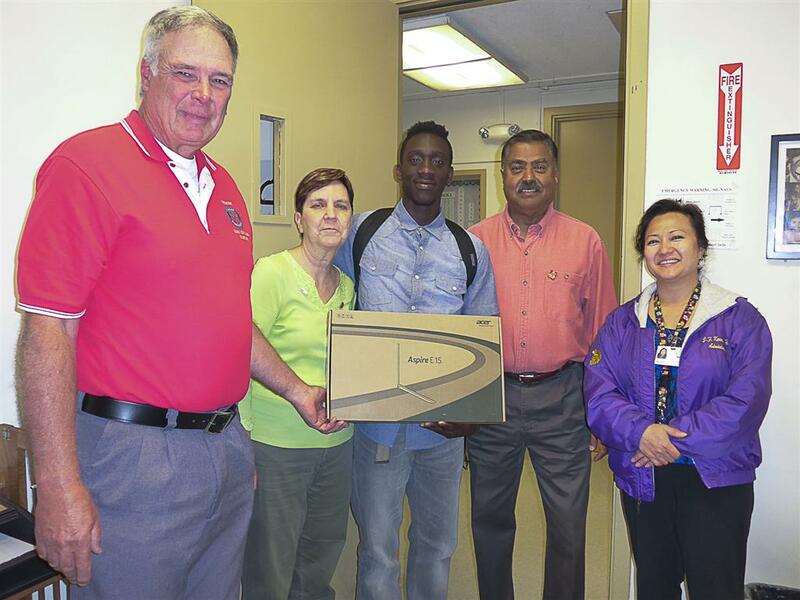 Isaiah Dario was awarded a new personal computer from the Fremont Warm Springs Sunrise Rotary club. 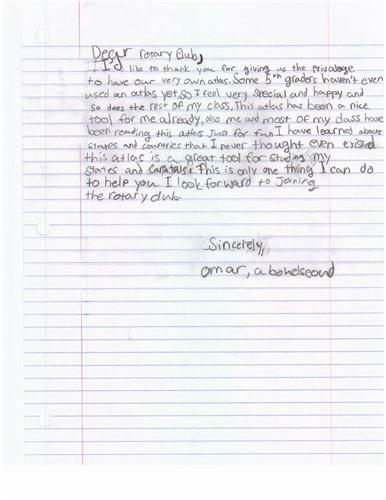 Dario was selected by the counseling staff at Kennedy HS as a dedicated, and economically deserving, student. Using a computer from Rotary D5170's 'Computers for Children at Risk' program, the FWSS and the Kennedy HS staff selected Isaiah as the recipient for this year's computer. Isaiah is graduating from Kennedy HS this spring and plans to attend college at Humboldt State University. He will be playing on the soccer team at Humboldt State and will use the personal computer to keep up with his school work while on long road trips with the soccer team. 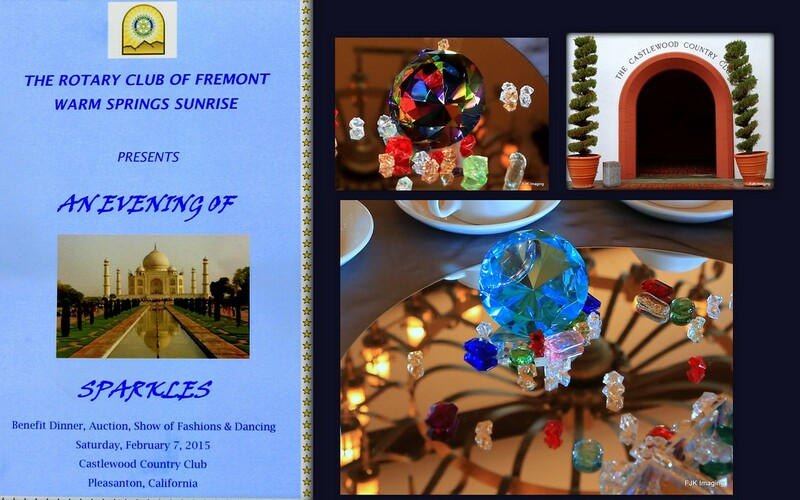 Close to 200 Rotarians and their guests attended the 'Evening of Sparkles at the Taj Mahal' on Feb 7, 2015. 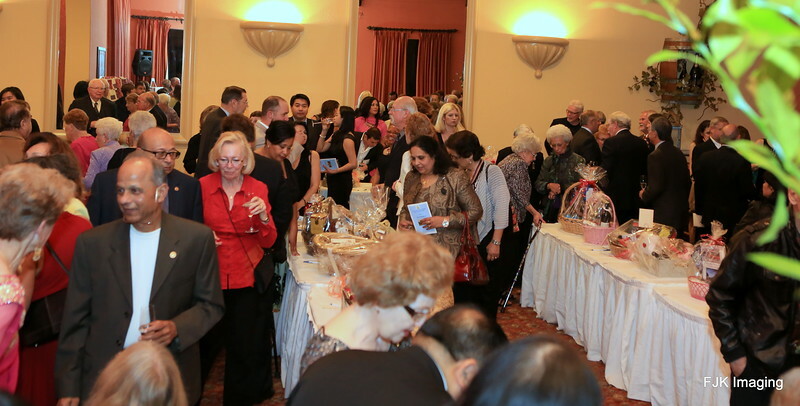 This elegant event was held at Castlewood CC and included a champagne reception, silent auction, wonderful dinner, live auction, and fascinating show of fashion featuring Indian saris. Each year, the Rotarians of FWSS (Fremont Warm Springs Sunrise) distribute atlases, dictionaries, or thesauruses to students in FUSD. This Fall, over 1200 thesauruses are being delivered to 5th grade students. As a community srevice project, the FWSS Rotarians surveyed the FUSD school principals to understand the students needs for 2014/15 school, ordered, labeled, and then delivered the thesauruses (the principals chose thesaursuses this year to match the new Common Core curriculum being implemented in FUSD for 2014/15. Great fun and Great food for our club's Christmas Party on Dec 17. 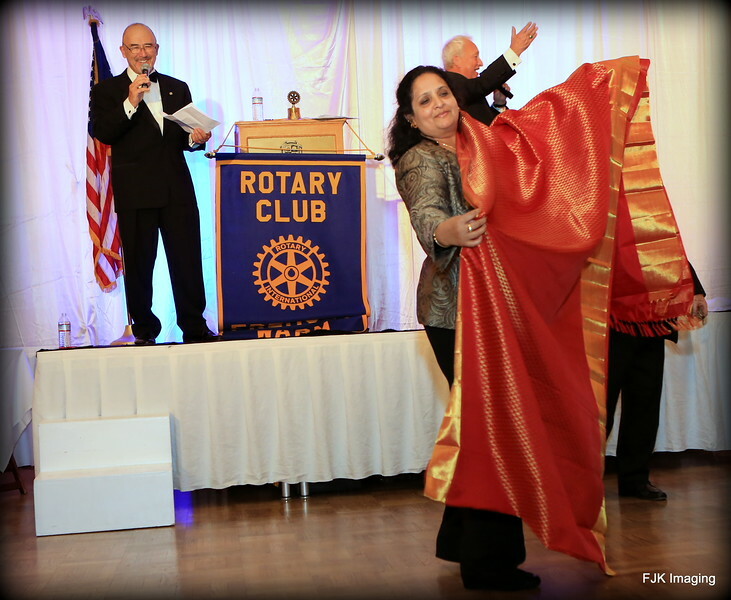 Thank you Geeta for opening your home for our club.